A TENAA listing from last month gave us a pretty good idea of what to expect from the nubia X smartphone with two displays so the latest leaks serves as more of a confirmation of what the phone will bring tomorrow. 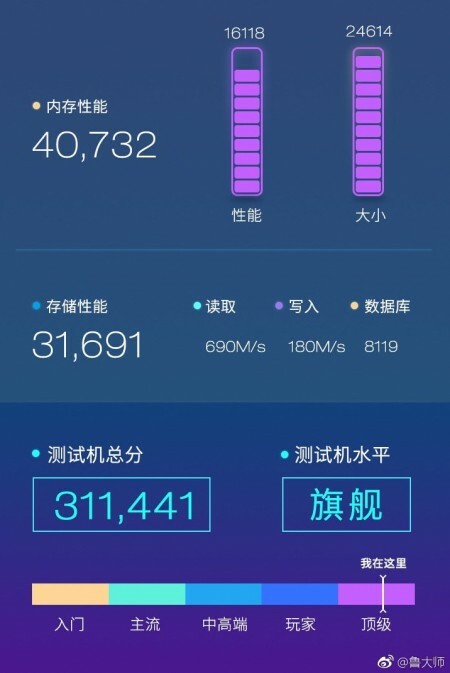 The Master Lu benchmark listing shows a respectable 311,411 score that's typical for a Snapdragon 845-powered flagship. It's paired with 8GB of RAM and the screenshot also lists the main screen with 1080 x 2280 resolution. We've seen this concept before on the YotaPhone, but this time around, the nubia X promises much larger rear display. Only one day until the announcement of this rather bizarre handset so we will keep you posted.